This impressive building, Silba's landmark is called Toreta, Marinic tower, Tower of love. 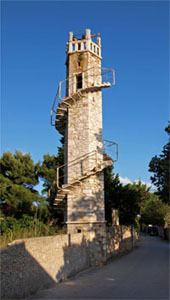 It is about 15 meters high hexagonal tower with spiral staircas. When you climb up, you will certainly be impressed by the beautiful view: the nearby islands of Olib and Premuda, as well as ones a bit more far away, like Losinj, Ilovik and even Pag. Tower is located very close to the center, near the local post office. 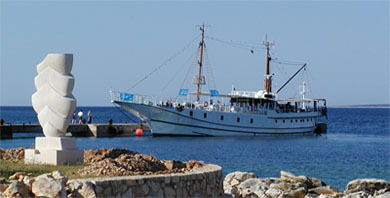 It was built in the 19th century by captain Petar Marinic, and legend says that it was in memory of an unforgotten love. This is the old building, or better to say, the old ruin of the windmill. It is situated 5 minutes from the center and stands there as a remainder of old times when people of Silba were much more involved in agriculture and rural economy. As you can see, this is a very old, or better to say, the oldest well on Silba. Today, it is not used any more and is very well hidden. It is also a remainder on times when this well was the only place on Silba where you could find the proper water for buildings which was not saltish. Some may say that this sculpture does not belong under this topic because it was made in 1997., but it was put on this page due to its purpose. And its purpose is to remind us on all sailors, fishermen and captains who died at sea. The sculpture is made by academic sculpturor Šime Vulas and is situated very close to the pier Zalic.